Just to complete the irony, I was looking for a video of the Oscar Grant shooting when I first discovered this “blocked site” page. I have previously reported on internet censorship in the United Arab Emirates. Turkey’s “you can’t see this” page is not nearly as flashy, and the censorship may be less severe: I can reach Flickr from here, for example. 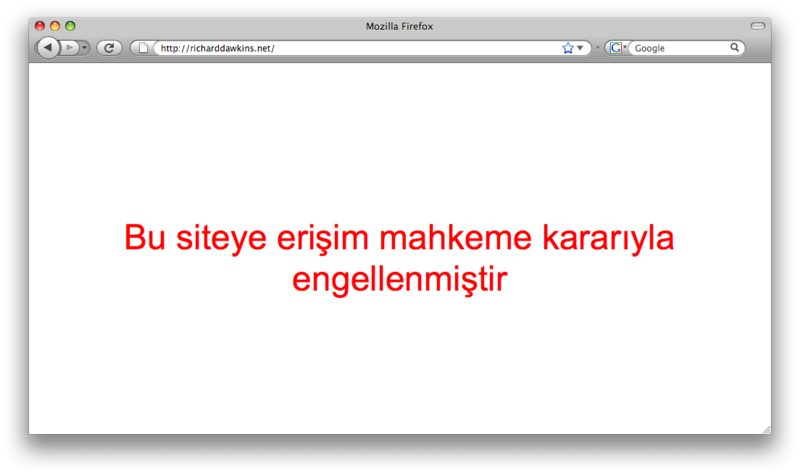 However, it is not possible to read the website of Richard Dawkins in Turkey; there even appears to be a more specific (and forthright?) banner page. For more, please see the fabulous Open Net Initiative, which tracks and reports on internet censorship worldwide, and has an excellent review article on the Turkish situation. Unsurprisingly, Turkey also has had some recent problems with freedom of expression. I am from Turkey. I am moved Dubai from Toronto soon. So, I know all the rules and policies related to internet access in those countries. A site could only be banned by a court decision unlike Dubai. I have never seen such a page in Canada though. You can find more information here: http://en.wikipedia.org/wiki/Internet_censorship#Turkey. In my opinion, the problem is stemming from interpretation of old-fashioned, narrow-minded judges in Turkey not the law itself. is there any impact of that?